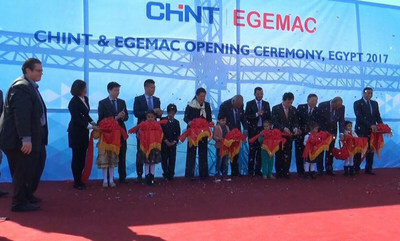 – CHINT to jointly operate the new factory with energy company Egyptian German Electrical Manufacturing Co. (EGEMAC). – CHINT seen as China’s largest industrial electrical company in terms of sales and production volume, while EGEMAC is known for its robust client base and comprehensive business dealings worldwide. CAIRO, Feb. 21, 2017 /PRNewswire/ — CHINT Group, a leading Chinese company in the fields of industrial electrical equipment production and clean energy, celebrated the grand opening of its first factory in the low-voltage switchgear manufacturing, CHINT EGEMAC, in Cairo on February 19th. A joint venture between CHINT and EGEMAC, the new factory marks a significant step in its expansion into the African market. Developing on its core technology, NGC8, CHINT EGEMAC will offer multiple types of low-voltage switchgears that are tailor-made to meet the local demands. Production of the first switchgear is expected to be completed on March 1st and the factory’s estimated annual production will be approximately five million dollars. CHINT EGEMAC leverages the expertise of its founding companies in the areas of technology and market resource to become the main low-voltage solution provider in the Middle East and Africa. Mr. Nan also emphasized the significance of localization while elaborating on the company’s strategy. “We will formulate a localized team to better serve the region’s demands. This will not only help us to penetrate into the local market, but also create social benefits as it brings more job opportunities to the local residents,” he said. Low-voltage switchgear products are widely used in areas ranging from power generation, distribution and transmission of electric power systems to ship or oil drilling platforms, as well as industrial and mining segments and commercial buildings. The products help ensure the stability and security of the power used and reinforce the concept of clean energy through its application in sectors such as hydropower and wind power.